Primarily used for outer cable jackets, but also used in connectors or as dielectric medium. 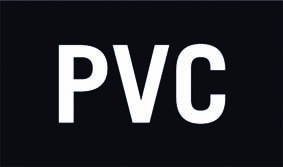 While PVC is flame-retardant like PUR, it is not halogen-free and produces highly toxic and corrosive fumes when burnt. It offers good resistance to UV radiation, chemicals and oil.